A full-flavored pasta salad made with chicken, tomatoes, olives, scallions and corn. Pace Picante Sauce adds just the right amount of kick! corn on the cob, large ears	 12 ea. 1. Grill corn in husks over medium fire until almost cooked, about 10 minutes. Remove from heat and chill. Husk and clean. Cut kernels off cob and reserve. 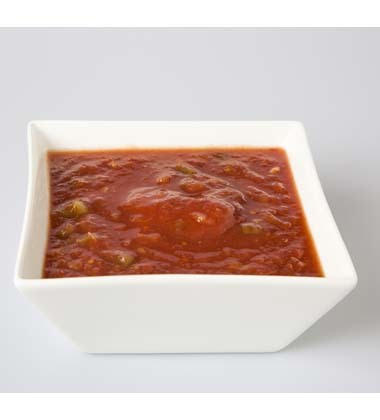 Smoothly blended tomatoes, chunks of savory onions and of course, our famously fresh, hand-picked jalapeños, make Pace® Picante sauce the perfect ingredient or dip. southwest seasoning blend	 1 1/2 tbsp. 2. In a bowl whisk together Picante Sauce, mayonnaise and seasoning blend. Cover. CCP: Refrigerate below 40°F. cooked shell shaped pasta, hot	 3 qt. assorted bell peppers (green, red, yellow), diced	 4 lb. 3 qt. cooked boneless, skinless chicken breast, cut into strips	 5 lb. tomato, diced	 2 lb. 3 qt. 3. In large bowl toss together pasta, peppers, chicken, tomatoes, olives, scallions and grilled corn kernels. Place in full-size hotel pan. 4. Stir in Picante-mayonnaise dressing and toss gently to coat thoroughly. Cover. CCP: Refrigerate below 40°F. at least 4 hours before serving. corn on the cob	 12 ea. cooked shell shaped pasta	 3 qt. assorted bell peppers (green, red, yellow)	 3.75 lb. 3 qt. cooked boneless, skinless chicken breast	 4.5 lb. tomato	 2.25 lb. 3 qt.